Scottish Dream Tours: Did you know? 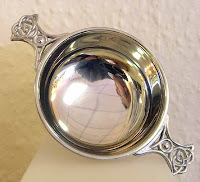 The Quaich (pronounced "quake") has a rich heritage in Scotland and are a uniquely Scottish invention. This traditional Scottish drinking cup was used to offer a guest a cup of welcome and also as a farewell drink, usually a dram of whisky. Travelers would often carry a quaich with them. Although they were primarily used for whisky and brandy some larger quaichs were used for ale. It is thought that the very first quaich was fashioned from a scallop shell, in which drams of whisky were taken in the Highlands and Islands. Shells were wide and holly and lent themselves to the distinctive shape that has been around for more than four hundred years. Traditionally quaichs were made of wood and were a shallow cup with a pair of small lug handles on opposite sides of the rim. The centre of the bowl was usually decorated with a silver coin or with coat-of-arms, initials or motto. In the late seventeenth century quaichs began to be made in pewter, silver and gold. Silver quaichs are first mentioned in the 1660s. The Quaich in 1745 travelled from Edinburgh to Derby with the Scottish Army in Bonnie Prince Charlie's canteen. Its bottom was made of glass so that the drinker could keep watch on his companions. A more romantic Quaich had a double glass bottom in which was kept a lock of hair, so that the owner could drink to his lady love. In modern times, the Quaich has been used as a favour at many Scottish weddings, being presented to all at the top table. The Quaich has a unique history surrounded with myth and mystique. In ancient time it is believed that the Druids filled the quaich with blood from the heart of sacrificed humans. It has a special place in the heart of all who know something of its history and is a prized possession of many people who have an association with Scotland. It will always be remembered as a visitor's welcome or farewell cup by proud clan chiefs, worthy merchants or humble crofters with its simple but beautiful shape and friendly purpose.